If you are a big straw user you cant go past oz farmer. good for the environment . Great to use. Fast delivery. easy check out. I will get all my straws here now. At first I thought they would be dangerous as they are glass but they are surprisingly strong very good product thanks! If you love slurping on a fresh juice or smoothie, you will be in raptures to find these new eco friendly glass straws, now in a range of colours. 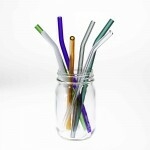 Made of a glass called borosilicate (what pyrex dishes are made of), these straws are tough and heat friendly. You could even use one to slurp your morning coffee (although your tongue might not be so thrilled at that prospect). Choose from a range of colours in both the straight and bent version. Ditch the disposable straw and replace it with a reusable glass straw. Chemical and plastic free, reusable and safe for children under adult supervision. These straws are 9mm wide and fit perfectly into our straw lids, but not the daisy lids. 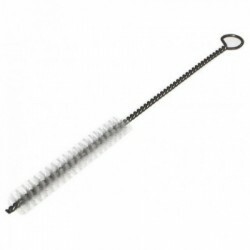 Overall length 23cm. These are fabulous teamed with the blue heritage jars or use with a wide mouth pint to serve smoothies, cocktails and milkshakes. Listing is for single straw in a bent variety. 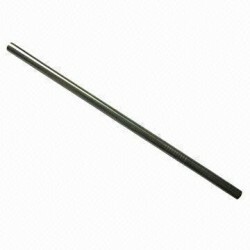 Check our other listings for straight straws and mixed packs. 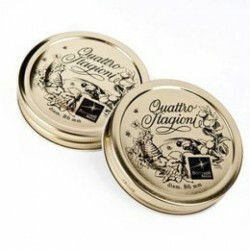 Jar and lid for illustrative purposes only and not included but can be purchased separately. 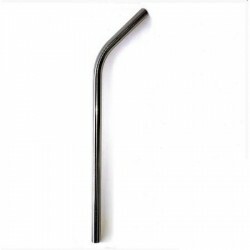 Glass Drinking Straw 9mm StraightIf you love slurping on a fresh juice or smoothie, you will be .. Available in 3 sizes: 56mm, 70mm and 86mm.The 56mm lids come in a pack of 3 whilst the 70mm and ..
C'mon Ozi C'mom! Get a quality Ozi Pint Jar! Embossed with an image of Australia and the words "Ozi..